To journal - or not to journal. Or, it might be mere happenstance that Laurel posted about her bullet journaling just last week. In any case, here is my take on it and I hope you enjoy the read. Not so much because those gadgets wouldn’t work, but because all the info was scattered in a gazillion places, and if I didn’t remember to look up “Family Calendar” entries at the beginning of the week, it just might have happened I forgot about kid1’s dentist appointment altogether. Again. As probably anyone can see how frustrating and embarrassing this is, I was on a constant lookout for things to help me organize my life and all the gazillion demands of family life and writer’s life somehow—somehow better. And, in the process, stumbled over bullet journaling last summer. Another notebook? Fancy pens? Writing things down on actual paper and doodling in the margins? Sign me up! My first bullet journal arrived in August. Since then, I’m totally into the whole concept. It’s on my desk when I’m at work. It’s on the kitchen table when I’m at home. I take it with me whenever I leave the house. Sure, it’s not digital; I can’t share stuff with a few clicks and can’t invite people in. BUT I've got all the info I need in one place. In contrast to Laurel, I use my journal in a more formal und structured way. Monthlies. Weeklies. Collections. But no transcripts of webinars. Those as well as character development or plot bunny hunts go in another, separate notebook dedicated to the specific project. 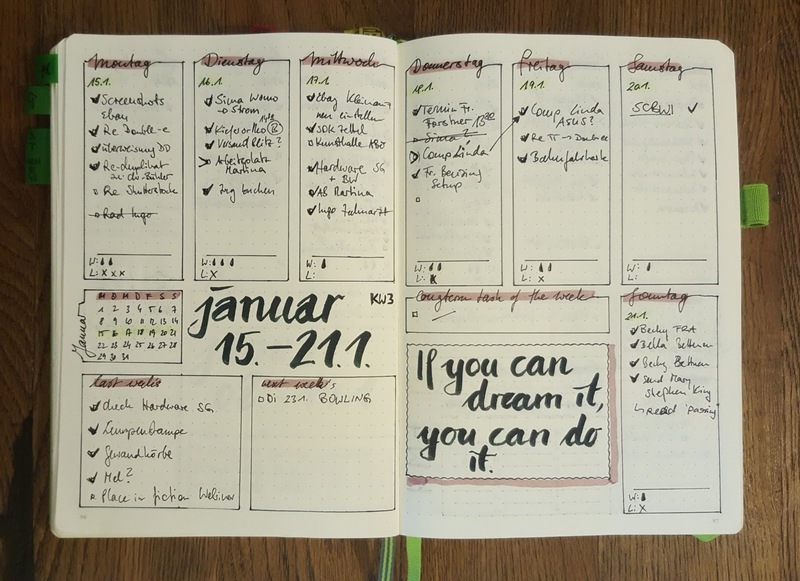 This is a weekly spread from January 2018 and shows my current layout. 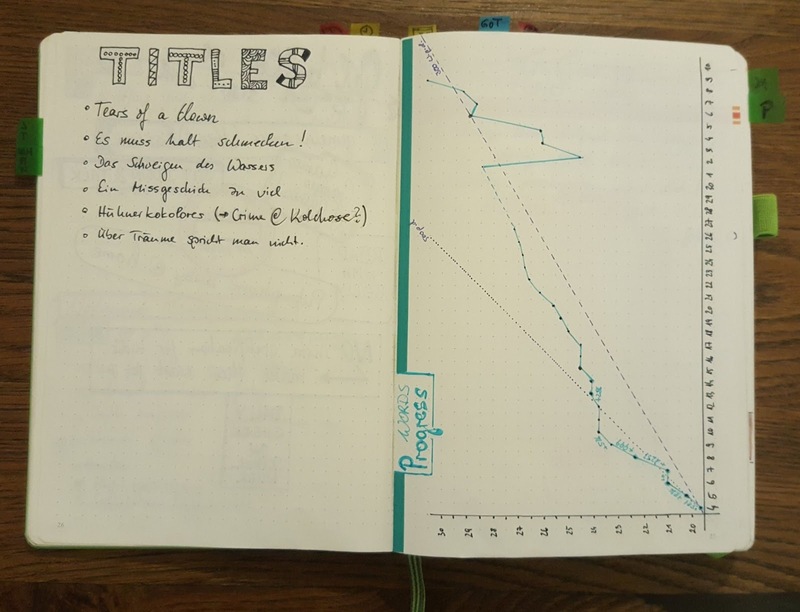 Here are a few spreads and collections from my journal that are more writing related with a short explanation what I aim for by keeping them. Those pages are basically to-do lists that may or may not be related to writing. There’s a “Books to Read”, “Movies to Watch”spread and “Possible Blog Post Topics” list in my journal. I expand these pages as I go. Recommendations come from various sources. A novel might be discussed in detail in a book on the craft, a story might be praised by a well-known author or a friend. Or I’m at the cinema and simply see a movie trailer that seems intriguing… Much of this relates to story structure analysis and getting a sense for what works and what does not. 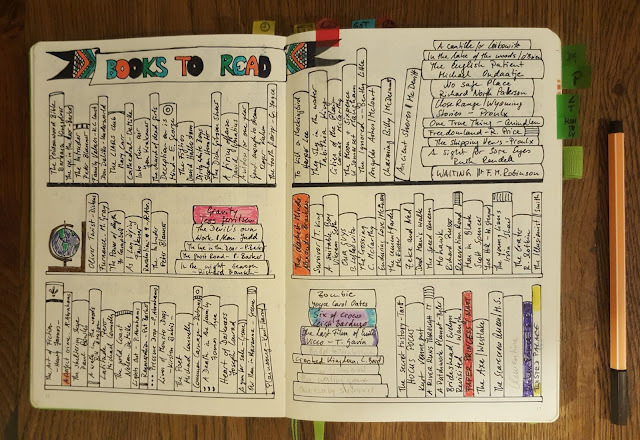 When I’ve seen a movie on the list or finished reading a book, I color its entrance in the journal. The visual clue helps get a sense for progress and as I collect these items from various sources, it helps me study more than just the hyped new stories, but classics as well. Guess this is full already and I have to start a second spread! Did I write at least 300 words the day? Did I show up for 5amwritersclub? Write a blogpost that day? …and so on. Keeping track of these things helps me figure out where I can improve and if I’m following my self-imposed rules. Tracking the habits I want to reinforce is a good approach to get better at these. I do track a lot of family and personal stuff here too. Laundry? French lesson with Babble? Workout, water intake, vitamins? You name it. This section can be as large and wide as you want. 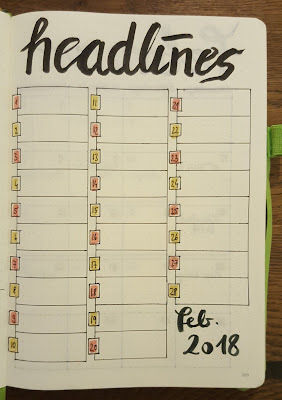 Those who track less items might include it in a weekly spread; I do one for each month. Apart from the daily habits I include progress pages when I’m done outlining a certain project and start actually writing things down. Other uses might be to track challenges like Storystorm or NaNoWriMo. There are as many different pages here as there are details writers notice on a daily basis. Keeping track of these things helps me figure out where I can improve and if I’m following my self-imposed rules. 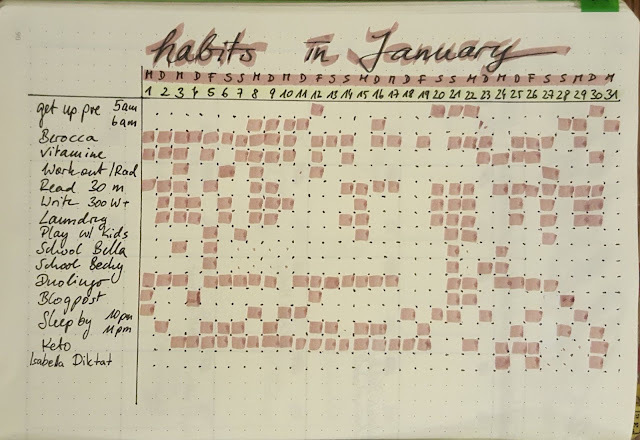 Tracking the habits I want to reinforce is a good approach to get better at these. Encountered the most peculiar person on the subway? Write down a quick sketch on your Odd Characters page. Gnawed on a particular plot hole on the commute to work and realized you’d need to research a certain topic in more depths? Write it down on the Research page. The list of possible pages goes on and on. Dialogue snippets, random title ideas, sudden idea sparks, interesting professions and hobbies, possible character names, words—always words!—English or German, whatever tickles my fancy, piques my interest, or might be remotely connected to a current project: I jot it down. Titles page and an example for tracking word count progress. See the cut? Husband said to scrap the first chapter entirely (and he was right). And yes, I mix German and English a lot. What makes the bullet journal work for me is the compact and concise nature of the thing. The data isn’t distributed to seventeen different apps, but in a real, solid, touchable notebook. It’s flexible enough to adjust to the need of the person using it and, once started, you might find you can’t do without anymore. While I have found a layout that suits me just fine right now, I can change, tweak and adjust as I go. Pinterest is a well of new ideas! Newest addition in January was a Headlines page where I jot down one sentence or a few words that summarize each day. 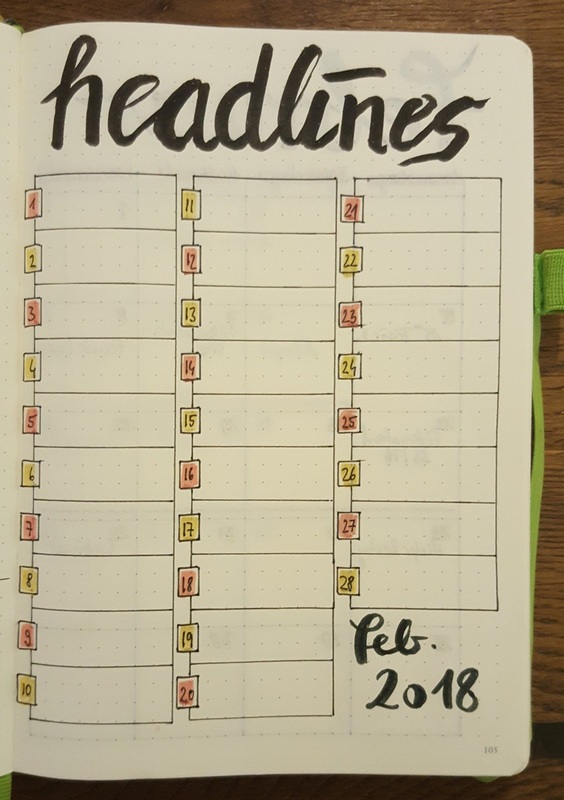 It’s like a short diary of sorts and I like it so much I've already prepared the same page for February, too. Got any questions? I’m happy to answer them. Feel free to ask in the comments section. KATJA RAMMER is a native German but writes mostly in English. At the moment, she working on a YA dystopia. Whenever a particular plot hole bugs her, she turns to poetry. Fascinated with story structure, she devours craft books on the topic at alarming speed. Married mom of two and member of #5amwritersclub, she is constantly sleep-deprived but happy as long as there are a pen and a notebook at hand. You can find her on Twitter and on her blog, where she writes about her journey as a writer and collects some of her poems.